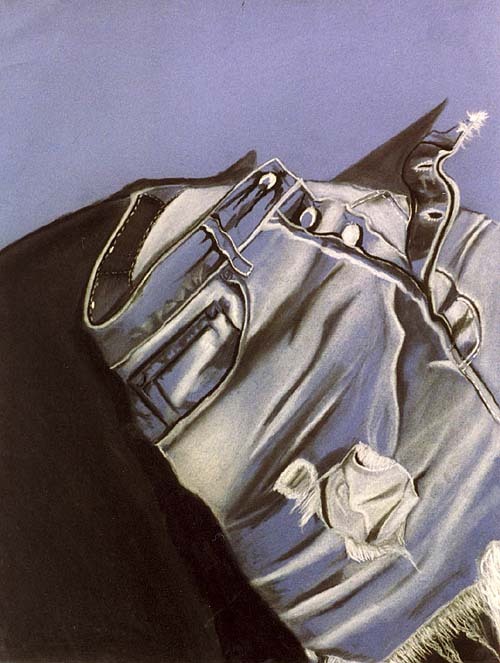 still-life studies can be self portraits, depict complex narratives, convey psychological, political, intellectual themes with subtlety or extreme clarity. 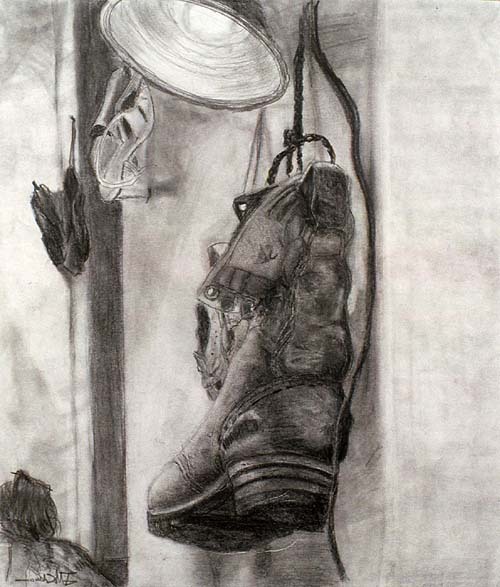 while thematic intent, and mood were issues the group focused on while working, and then later examined as a critique topic, the development of observational drawing skill was the primary goal- attention to proportions, scale, perspective, and matching values, textures..
the shoe drawing was the first refined value study of the quarter, finished by the third week of fundamentals of drawing. i had a big box of old shoes that the students set up and spotlit. they completed several small line/value sketches before starting the piece, in order to work out the composition, as well as perspective and proportions. 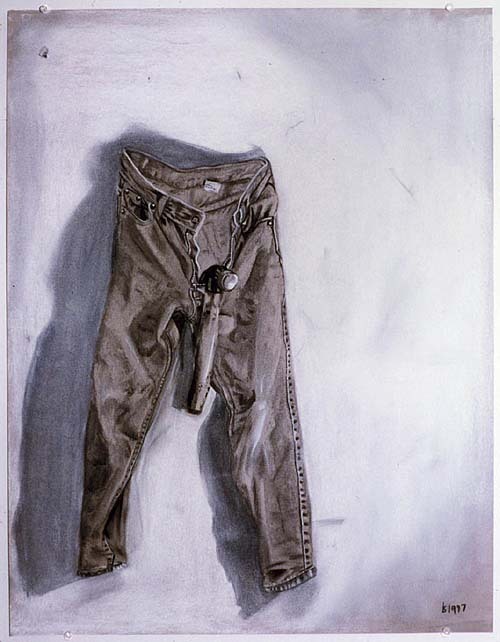 jeans with hammer, a statement about masculinity? fundamentals of drawing students brought in, set up their own jeans, and placed the lighting. the clothing has a history. it suggests body. 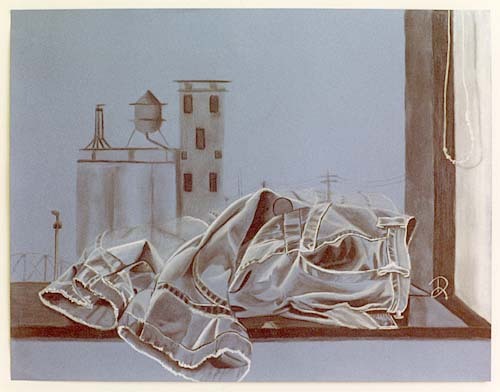 with his/her still-life set up, compositional choices, and drawing style, each student tells a different story. lots of energy, with emphasis on the diagonal. a landscape and historical document. that building outside the window with the water tank has since been torn down and replaced with a high rise. 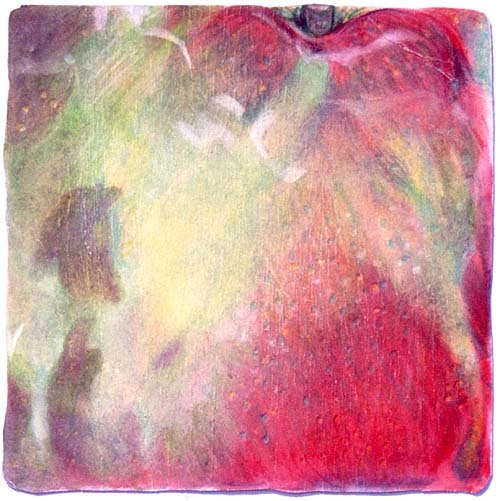 students drew a small section of an apple in color theory class. this project taught the basics of color mixing, particularly the mixing of complementary colors for the matching lower intensity, naturalistic hues. additionally, the transformation of an ordinary object was achieved through extreme cropping and the the employment of a miniature picture plane, around 5 cm square. here the drawing appears to be about twice it's actual size.